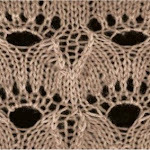 I am going crazy tyring to find this stitch! Hi, I bought a hand knitted scarf in New Zealand at a Saturday Market and it had a very unusal stitch. I ask the lady what it was and she said it was knit the purls and purl the knits…well that’s a seed stitch (didn’t know that at the time), so I thought simple enough…brought it home and it’s not that stitch. I have taken this scarf to all of the yarn stores in my city, one of which is a master knitter and we can’t figure this out. It has ribbing on one side but the other side is totally different. It kinda looks like a Brioche stitch where you knit in the row below, but then it doesn’t come out ribbed on the other side. I am really stumped on this one. If you have a way I can email you pictures of the scarf and the stitches, I would love to do that and would appreciate any help I can find!! Oh I just realized I can post pictures on here I think…when I get home today I will try that…. Hi, as you describe it it sounds like a ‘fake brioche’ I know and have used in a sweater. You switch between knit1 and purl1 on the wrong side rows, and only knit on the right side rows. One of my german knitting books calls it ’sand pattern’, and it appears like ribs on one side, and has a kind of bumpy appearance on the the other side. It is a very warm stitch and I could thnk it works fine for a scarf. Maybe you tell me where to see a picture of it and I can see if I am totally of track.